Brooklyn has a lot of good pizza. These are the best. Speedy Romeo is the best restaurant you haven’t been to. Seriously. Take all of the other places on your Hit List and push them aside until you’ve been to Clinton Hill to check out what’s going on here. We don’t tend to speak in absolutes, and we don’t typically like jacking up your expectations for a meal by telling you it’s the number one best anything. But we have no problem making the statement we did today about Speedy Romeo. Why? Because places like this are what keep us going. We love nothing more than discovering a true neighborhood restaurant, and then finding that the food in that restaurant is also incredible. There is also nothing better than when you can tell that the people who frequent that restaurant really feel like it’s partly theirs, just because they live nearby and the staff is nice to them when they walk in the door. We certainly felt that way after a few visits, even though it took us 45 minutes and three subways to get there. That’s what’s going down at Speedy Romeo. If you’ve heard anything about Speedy Romeo or done a little bit of research, it’s pretty likely that you got the impression that this is another Brooklyn pizza joint. You wouldn’t be entirely wrong about that - they most definitely make pizzas here, and their pizzas are awesome. But what really blew us away about this place was the rest of the menu, the entirety of which is cooked over wood flames. You see, when Speedy Romeo’s chef and owner decided to convert this old auto body shop into a restaurant, they decided not to put in any gas lines. So there are no stoves or convection ovens in the kitchen. There is only fire. And chef Justin Bazdarich, a guy who trained under Jean Georges, knows what he’s going with it. The Kansas City Strip Steak here is one of the best steaks we’ve hand in recent memory. The burger is excellent. And yes, those pizzas that everyone talks about are very good, too. 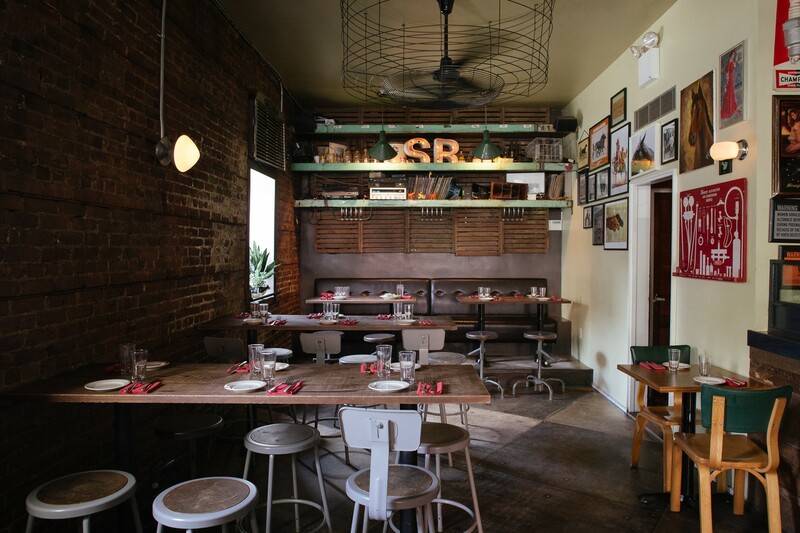 As a matter of fact, everything we have eaten at Speedy Romeo has thoroughly impressed us. So much so that they have us talking in absolutes. Put it on your Hit List and make the trip. Then feel free to thank us. On second thought, thank them. All that talk about fire and wood burning ovens, and one of our favorite things to eat at Speedy Romeo is a salad. Didn’t see that coming. What makes this particular salad so awesome is that all of the good Caesar flavors are cranked up to extreme. There’s so much taste on these greens that your lips will water and your eyes will pucker. And you’ll love every minute of it. OK, so I have a confession to make. I ordered this beet because a grilled beet sounded really good at that moment. And it was good. But it also may or may not have shot off my plate like Clark Griswold’s saucer sled when I cut into it, and I have NO IDEA where it went. So yeah, if anyone at the restaurant happened to find half a beet mysteriously chilling on the floor after dinner service a few Saturdays ago... my bad. Easily one of the most delicious grilled octopus dishes we have ever come across. That mesquite smoke does wonderful things to the meat, and the super hot oven ensures that everything is tender but also slightly charred and crispy on the outside. The romesco sauce on the plate is an excellent kicker, too. You want this. No... you need this. First of all, the house-made mozzarella here is amazing. It’s super fresh, creamy, and pretty much perfect. But what’s equally important about this dish is the way this mozzarella is served. Next to the cheese are a few pieces of bread with brown butter and a butternut squash puree spread on top. You sort of make an open-faced sandwich by placing the mozz on the bread, and then you try and figure out why you’ve been deprived of something this good until now. I’m not even gonna hesitate. This is one of the best steaks in New York. It’s an incredible cut of meat, and it arrives at your table perfectly cooked and sitting next to some potatoes and a side of salsa verde. Those things on the side are nice and all, but you’ll hardly notice them. You’ll be too busy shoving steak in your mouth. On top of everything else, Speedy Romeo also happens to have a really good burger. It’s a half-pounder that’s been topped with Provel cheese (a processed cheese made from cheddar, Swiss, and provolone that's very popular in St. Louis cuisine) and wrapped in wax paper so the sesame seed bun steams a little. We loved it. This pizza has become something of a calling card for Speedy Romeo, probably just because people from St. Louis are so happy to celebrate something that their hometown gave to the world other than Nelly. The Saint Louie is a pizza made in the style of its namesake city, in which Provel cheese is used instead of your typical mozzarella, and pieces are cut into squares rather than triangles. It’s really good and different than the pizzas you’re used to. Also, make sure you put extra pickled peppers on top. There will be a jarful at your table. This is actually the pizza we love most here. Speck, pineapple, Provel, and grilled scallions make for a good combination. It’s essentially a Hawaiian pizza, but way better than the one you used to get from Pizza Hut when you were 11. The White Album was another awesome pie, but I’m also pretty sure it’s still in my system. There’s so much cheese on this thing that chewed gum probably digests faster. It’s a white pizza (hence the reference) with roasted garlic, ricotta, Provel, pecorino, and some kind of béchamel, just in case the first three cheeses weren’t enough to make you lactose intolerant forever. This more of a brownie-type s’more thing than it is a piece of cake, but it’s delicious either way. And the marshmallow on top is scorched with a hot branding iron. So that’s cool. Order it. Family friendly, celeb-heavy and aesthetically pleasing, Bubby's represents its Tribeca zip code hard. This is It's one of the better known Chronic Brunch spots around town. A dimly-lit, well conceived Latin American restaurant in Fort Greene that only lacks one thing - flavor. We want to love Colonia Verde. We just can't taste it.